11th December 1996 - Unplanned, but Welcome storm chase. COPYRIGHT: All photo's on this and my other pages are copyright of Michael Thompson. However use for any non-profit purposes can be had in most instances by simply E Mailing first. I must admit that my hopes for storm potential when leaving Wagga on Wednesday at 11 am were not high. I had not heard any weather forecasts for over 24 hours and my forecasts were for only an outside chance of a thunder shower from the NW direction. \At Wagga at 11am there was some alto-stratus/cumulus that was clearing rapidly from the NW. Towards the NW it was all clear ( this was the direction that I presumed any activity may develop from, I was wrong ). I took the Olympic Way home from Wagga. About 30 mins into the trip the first isolated convection clouds started appearing. Nothing even resembling a cell, but none the less, increasing in number. After passing Cootamundra I started to get better views towards the North and North East, lo and behold there was some cumulus rapidly developing into potential storm cells. These I estimated to be in the Orange area. Unfortunately the next leg of the trip to Yass would take me away from that direction, as the road connecting back to the Hume Hwy runs E/SE for 70 kms. 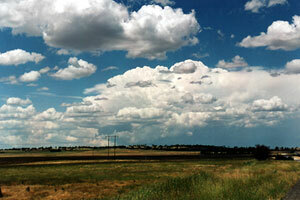 I arrived at Yass at 1pm and some cumulus clouds were showing promise, but it still was all typical convection stuff. 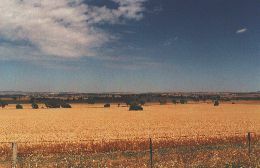 Between Yass and Goulburn I got my first glimpses at much larger cells along the eastern horizon. By now the amount of small convection clouds was making it hard to see these. By the time I got to Goulburn the view was better, there were several large storm cells of interest. One to the SE was very large with a pronounced back building on the anvil. Another to the E/NE was smaller but developing rapidly. There was another to the N/NE that also was quite large. I knew my route would come close to the smaller one. As I got closer I could start to make some of the lower features. The clouds until this stage were strictly typical convection cumulus. The wind was a warm West. The larger cells to the east had much lower bases, and some of the low cloud features were not dissimilar to a front. I calculated that this unstable area was probably were the humid NE sea breeze was meeting the dry west air. From Marulan to the Illawarra Hwy turnoff I could see a good flanking line feeding into the storm to the east. There was quite a jumble of lower clouds making it hard to see the cell on its own. I entered under the flanking line after taking the Illawarra Hwy turnoff. I wanted to pull over and get some pictures but the hilly terrain and large trees made for poor photo opportunities. At Moss Vale it was dry, but very dull with frequent loud booms of thunder. I was hoping to make it out of town and get a photo before the action hit. The occasional glimpses I had of the base showed that lovely olive / blue colour. I nearly made it out of Moss Vale but a sudden gust of cold air and low scud clouds from the SE told me I would not. The rain hit just east of Moss Vale, then the hail. Visibility was down to only about 100ft. I pulled over the get some photo's but as soon as I tried to get a window open, hail just bounced in everywhere. I decided to continue, at this stage most cars had pulled off the road and taken shelter under trees ( just as well a downburst did not hit ), hail became very heavy, but never larger then a 10c piece ( about 1inch ). 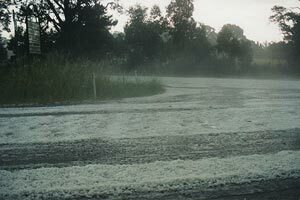 At around the Fitzroy Falls turn-off the hail was laying 2-3ins deep over the road. Paddocks were as white as if it had snowed. Driving was very tricky, I was only doing about 15 kph and slid sideways on the hail at one stage. The hail was also causing a constant rain of leaf and twig litter from the trees overhanging the road. Winds did get to 20-30knots, but I was surprised that they did not get stronger. By the time I reached Robertson the hail had been left behind. The moist NE wind being uplifted on the Illawarra escarpment had made for fog at the top of the 700m ( 2000ft ) Macquarie pass , this combined with being under the anvil turned to conditions to quite dark. It was still 4 hours off sunset, but the best shutter speed my camera could recommend was a quarter of a second. It was very eerie seeing lightning flash in the extremely thick fog. When I finally reached home it was just another typical Mt Warrigal storm, an old anvil decaying rapidly, some lightning and steady rain, but no hail. Only 3mm fell at my home. It was a unplanned storm chase, and for a change it was great to approach a storm from the west.